Dieser Projektor ist in England/Irland aufgetaucht. Längere Zeit fehlten jegliche Informationen zu dem Tonlaufwerk. 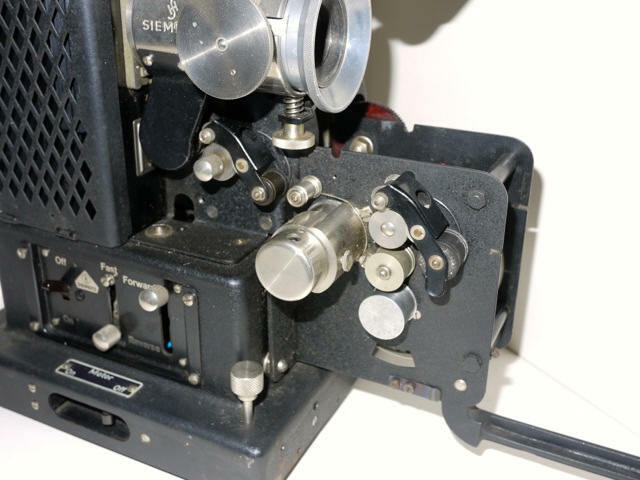 In this year(1932), in Germany, Siemens were manufacturing their projector models HOME, STANDARD, 375 and GROSSRAUM and with sound-on-film provided by the KLANGFILM attachment using a choice of three(3) different options of separate base amplifier. All used the D.I.N. Standard sound system. 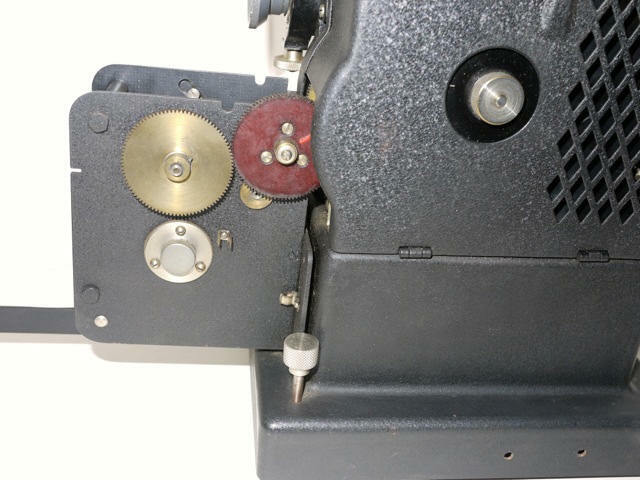 In the UK Gaumont-British took control of British Acoustics Films Ltd. and other Companies involved in film production, distribution, screening(Cinemas) and certain equipment manufacturing Companies. 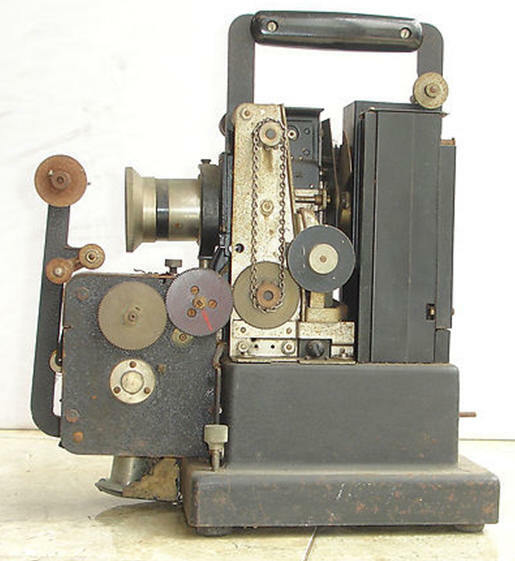 In December they produced their second projector model known as ‘Grosvenor’. All were using D.I.N. Standard sound heads. In the same year the Siemens STANDARD projector with Beta movement was first introduced into the UK. In order to screen films with the SMPE sound track they offered a ‘Prism Attachment’ to reverse the film when projected on the screen. Later that year they offered MODEL ‘C’ (Type B.A.C.) 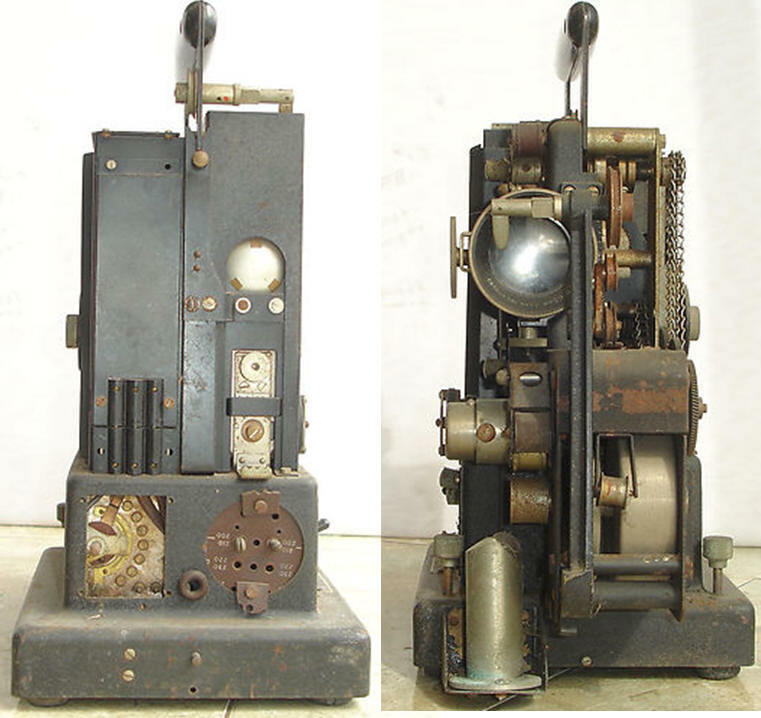 which was a Siemens STANDARD Projector with a B.A. (British Acoustics) sound head, and a MODEL ‘D’ (Superlux) which was a modified Siemens ‘Superlux’ (Grossraum) projector, again with a B.A. sound head. The price of the latter 250.00 GBP. Each of these two models were ‘modified’ Siemens projectors which were mounted on their Amplifier cases, similar to the Siemens models offered in Germany with KLANGFILM sound heads and mounted on base Amplifier cases. fitting a mains voltage neon lamp to illuminate a stroboscope pattern on the fly-wheel to regulate the sound speed of 24 fps and modifying the large projector lens unit to accept an internal sleeved regular Siemens Dallmeyer 50mm lens instead of the more expensive Astro-Kino lens (three times the cost), and lastly an internally modified ‘tilting’ arrangement where the two controls are linked by chain so that either knob can lower or elevate the position of the projector. From this year the projectors offered by G.B. Equipments Ltd. were known as ‘Gebescopes’. As stated previously, in March of this year agreement was reached to only use the SMPE Standard sound head system so the BA Sound Head was available in the new design as well as in the D.I.N. Standard G.B. Equipments also manufactured a SILENT version of their Model ‘A’ projector during this year. Model S16 (200W lamp) Silent Model. They offered Models K516, L516 with 500W lamps. 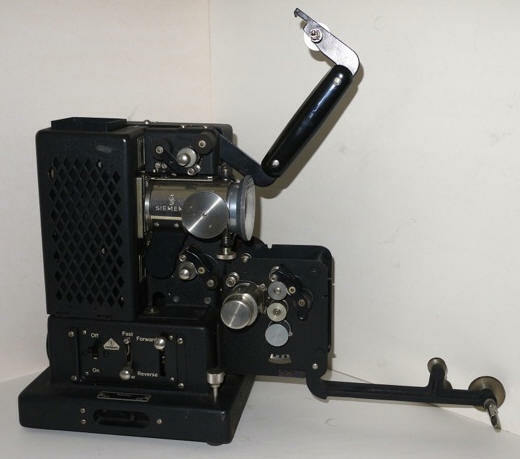 The Model L516 continued to be manufactured during the War Years and continued in popularity after the War but they only manufactured Bell & Howell models after the War..